The following account of the Company's contribution to the war effort during the First World War was an article published sometime after James Paxman, the Company's founder, had died in March 1922 (the photograph accompanying the original article refers to 'The Late Mr James Paxman'). STANDARD IRONWORKS, COLCHESTER, DURING THE WAR 1914-1918. The firm's war work began before this country had declared war against Germany, as on August 1st, 1914, it was instructed to supply the power plant for a wireless station in Egypt to complete the chain of communications. This first order had to be worked upon day and night without stopping until completed, which set the firm's pace throughout the length of the entire war. So pleased were the Authorities with the work done that the firm received most gratifying letters of thanks from H.M. Government for exceptional services rendered. In the first weeks the Board, through its Chairman, notified the Government that it unreservedly placed the firm at its disposal, and throughout the war its entire output was for war purposes of the greatest importance, including orders direct from almost every Government department and several foreign Governments, as well as for the large armament firms, including Messrs. Armstrong, Whitworth, Beardmores, Vickers, etc. The greatest part of its work was, however, for the Admiralty and Ministry of Munitions, although large orders were fulfilled for the War Office, Ministry of Air, Ministry of Food, Ministry of Shipping, Mechanical Warfare, Inland Water Transport, and Timber Supplies Departments. In the early days, Messrs. Davey, Paxman and Co., Ltd., was one of the three firms entrusted by the Admiralty for its secret work, and, throughout, a very great amount of the most secret work was undertaken by the firm in connection with submarine warfare, and the greatest possible care had to be taken to ensure no secrets leaking out. 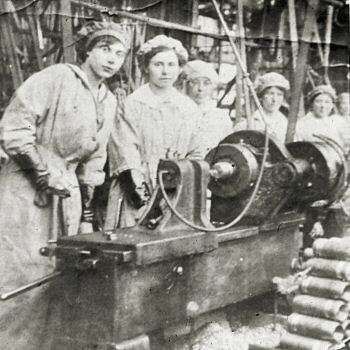 Although practically all the war work carried out by the firm necessitated the greatest accuracy in manufacture, it was one of the first to augment its employees with unskilled hands and women workers. The firm was the first to employ women on certain Admiralty work, and was the only one to do the entire machining of same with women, which was very successfully carried out by means of a special plant which was installed. Hundreds of women were employed, and to them the greatest possible credit is due. They worked splendidly night and day, and even week-ends, often-times under great difficulties, especially air raids, which were very frequent; but although special safety places were constructed, they were only used once, the employees, including the women, remaining at their work. It is safe to say that the firm could not have carried out under the circumstances as much work as they did had it not been for the women workers, whose work will always remain as an example at the Standard Ironworks. On several occasions the firm were commended by the Authorities for the amount of "dilution" they had effected, thereby releasing to the utmost men for the fighting forces. For a long time, Miss Paxman (the daughter of Major William Paxman) was engaged as a forewoman, as was also Miss Slaughter, both of whom did excellent work. In order to give comfort to the thousands of workers, many of whom came to work from a distance, a spacious fully-equipped canteen was built, where complete meals were cooked and served at all hours of day and night. The building also afforded accommodation for games and recreation. The Y.M.C.A. rendered most valuable service in connection with the canteen. With so much direct Government work on hand a large staff of resident Government officials became necessary, and the firm pays tribute to them, and also to visiting officials for their assistance. Throughout the whole war the firm's capacities were taxed to the utmost, several of the departments were enlarged, and new shops built, stores turned into manufacturing shops, and a vast amount of new machinery installed to meet the Government's orders, and later it became necessary to acquire an additional works. 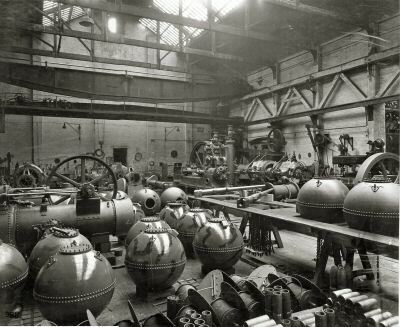 It would be quite impossible to here enumerate all the work carried out during the years of war, but in addition to the firm's ordinary products of boilers and engines, which were in constant demand by the Admiralty, War Office, and other Government departments, vast quantities of other war work were manufactured, including the famous Paravanes or submarine mine destructors, with their Rotary davits for manipulating same from battleships; 80 various type of quick-firing guns complete, including mountings, breach mechanisms and release gear for same; 7,600 sets of extractor gear and 100 sets of complete breach mechanism for other naval guns; many various parts of submarine engines; 1,600 anti-mine sweepers with which the firm was connected in the design and special manufacturing arrangements; 2,200 submarine mines, together with 2,200 sinkers for same, and many thousand sets of pistols, or operating gear, for the mines; 700 counter mines and 800 electric contact mines; also 1,100 special sinkers for use from submarines, and also 1,600 mine sinkers of the latest or Mark VIII. pattern. The firm also received. the order for 180 Sandford generators of the latest pattern, a very complicated piece of submarine mechanism, and one of the most unique and wonderful pieces of apparatus designed during the war, each one containing no less than 1,700 differently named parts. In addition, 125 sets of carriages for these were made. The firm received from the Admiralty special commendation for the manufacture of these. 68,000 hydraulic buffers for use with submarine mines. Over 11,000 firing mechanisms for submarine mines, including mechanical and electric operation. These latter required the use of over 500 tons of gun metal alone. The firm also manufactured to a fine art the famous depth charge, which did such splendid service against the submarine. The firm made over 20,000, including every pattern, the latest being made after the termination of the war. Left: Mines in one of the Paxman workshops. Behind the mines on the left is a partly assembled portable steam engine. At the back, a little to the right, is a partly assembled Paxman-Lentz tandem compound steam engine. Although the work was of great accuracy, out of all those despatched only 23 were returned for slight modifications; 264 depth charge throwers, each one of which was tested by firing weights weighing 300/400 lbs. in the Works' yards (the reports of these tests often caused consternation to some of the towns-people, who thought an air raid was in progress); 45,000 hydraulic release gears, 300 plunger kites, and 1,100 "Otters" - the commercial Paravanes and their bow booms. Regarding these Otters, the firm had news from the testing station that D.P. & Co.'s went through their tests best, quickest and easiest of all made. The firm also received by far the larger part of an order for a special apparatus, the design of which Mr. Sanders was largely responsible for, the other part being placed with two of the Government's dockyards. Twenty-one days only was allowed to make patterns, etc., and the firm, by most strenuous working, completed theirs in 19 days, thereby receiving the special thanks of the Admiralty. Many thousand sets of primer gear of various patterns also were made, besides hundreds of sets of roller guards for sinkers and alterations to hundreds of other type mines and sinkers. D.P. & Co. further had the order for 20 sets of engines and boilers complete for the standard ships. Also an order for 500 tractor hulls, a modified form of the celebrated "Tank". 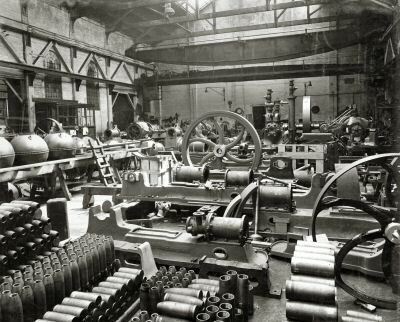 For the Ministry of Munitions, the firm specially made, partly in conjunction with the East Anglian Munitions Committee, just on 250,000 shells of various types, including 6in., 4.5in., 18-pounder and 13-pounder, together with 70,000 adapters, fuse plugs, etc., and tens of thousands of nose piece forgings for shells. Right: Another view of one of the Paxman workshops. To the left are mines and in the foreground parts for shells. engine which appears to be coupled to a refrigeration compressor. The firm also took on a large contract for the manufacture of aircraft engine parts, for which a special plant was installed. Also an order for thousands of parts for caterpillar tractors. In addition to above, the firm also undertook many thousands of various component parts, such as gun parts, standard ship parts, condensers for warships, castings, forgings, etc. , many of them being of great size, besides thousands of motor lorry parts, such as crankshafts, silencers, radiators, starting gears, and brake drums, etc., for Government contracting firms. Further, the firm also manufactured very many ammonia and carbonic acid compressors for the Lightfoot Refrigeration Co. Ltd., for use on battleships, explosive works, cordite and acetone factories, chemical works, margarine factories, etc., in fact, nearly every explosive works in this country and the Colonies had one or more of these machines, some of them being of very great size, and including such as the complete plant for H.M.S. Renown and other battleships; 26 sets for the War Office's barges for Mesopotamia, and such well-known factories as Messrs. Nobels, Pembrey, Ayrshire and South Africa; Kynochs, India and South Africa; Cotton Powder Factory, Faversham; National Explosives Factories; British Dyestuffs Corporation; Royal Naval Cordite Factories, Wareham and Stowmarket. Complete boiler plants were supplied to the Admiralty for Woolwich, Chatham, Hull, Immingham, Tynemouth, Wareham, etc. ; for the Air Ministry, National Aircraft Factory; also for Messrs. Kynochs, Nobels, Eleys, etc. ; also for the Murman Railway, Russia, and the Belgian State Railways, etc. In all 288 boilers were made during the war. The component parts of all the above runs into tens of millions, and it is doubtful, with the possible exception of a few armament firms, if any one firm undertook and carried out so successfully such a variety of complicated and accurate work, and in such large numbers, as was done by D.P. & Co. Such a record of work accomplished could not have been carried out had the firm not had the entire confidence, co-operation and assistance of every one of its employees, and it pays the greatest tribute of gratitude to them, including the Management, Engineers and Staff, with particular credit to Mr. J. Garvie, who was Works Manager during the major portion of the period; to the Engineers, particularly Messrs. Hazell and Bedwell, heads of departments, and the Foremen, on whom fell many added responsibilities and very long hours. It should be recorded that the very arduous work told greatly upon the health of some of the employees, and the firm had several cases where men and women remained at their work in spite of medical advice to the contrary, resulting in more than one case of loss of life, which was freely given in the country's service. In connection with the rescue of a man badly "gassed" by ammonia, Mr. Burch, one of the machine shop foremen, received the medal of the Order of the British Empire. Inspector George William Doe also rendered great service in connection with the Works Ambulance, Hospital and Fire Brigade, and the arduous duties of watching, all of which he and his department did most efficiently. In the very early days of the war, no less than 300 employees volunteered for active service, and the record of Davey, Paxman & Co.'s men in the fighting forces has been a grand one. Many of them made the supreme sacrifice, and the firm will ever mourn their loss. Others gained great distinction, serving throughout the entire war on all fronts, several of the lads joined up as privates and returned as Majors, and many won special honours and distinctions. Major William Paxman, Deputy-Chairman of the Company, who had for years been a leading spirit in the Volunteers, joined up, although over age, and was in active service from January, 1915, till after the termination of hostilities, and was decorated for his services. The Chairman of the Company - Mr. James Paxman - although of great age, took the greatest interest in the firm's doings, visiting it on several occasions (against medical advice), and kept in touch with the work and rendered valuable advice on many matters. Naturally the brunt of the responsibility and work fell upon the remaining active Directors - Mr. Percy A. Sanders and Mr. Richard Franklin, both of whom worked unceasingly throughout the period, chiefly at Colchester and London respectively, oftentimes for weeks on end without visiting their homes. Mr. Sanders joined up in 1914, and was granted a Commission, and later was "returned" to the Works by special order of the Admiralty, by whom the firm was controlled, to resume charge of the Works, and was placed upon the Special Reserve of Officers, being released only in 1922. In addition to the above, he was the Essex representative on the East Anglian Munitions Committee of the Ministry of Munitions, which did great service, and was President of the East Anglian Association of the Engineering Employers' Federation throughout the whole war period. He was appointed to the Corporation as a co-opted member in 1916, and later as one of Colchester's representatives to the Essex County Council. He has served since its formation on the Local Advisory Committee of the Ministry of Labour, and was, until its cessation, the Essex male representative on the Ministry of Labour Nucleus Council. Mr. Sanders was also appointed to the Local Board of the Lord Roberts's Memorial Workshops, and also to the National Executive Committee, for which services he was mentioned in despatches. He also took an active part in Colchester war activities. Mr. Franklin, an Old Colcestrian, formerly resident at Chelmsford (where he took an active part in war work), later removed to Gidea Park, so as to be near the headquarters of the various Government departments with which he was, in connection with war work, in constant communication. In 1916 he was co-opted a member of the Romford Urban District Council in view of his 10 years municipal experience at Chelmsford, subsequently serving on the Food Control Committee at Romford, serving on both bodies until after the end of the war, being accorded the best thanks of the Romford U.D.C. for exceptional services rendered. Both Mr. Sanders and Mr. Franklin received decorations from His Majesty the King, and special letters of thanks as recognition of the special services rendered by them.